Fronting the Straits of Johor, IWCity Harbourfront is the heart of IWCity where waterfront lifestyle is at its best. IWCity Harbourfront will feature a public boardwalk promenade that links all precincts of the River City together. IWCity Harbourfront consists of four main components: City Centre, Cultural Centre Precinct, Central Marina Precinct and Marina Condo Precinct. The IWCity Harbourfront City Centre is the River City CBD of IWCity featuring premium waterfront high-rise condominium development and maintaining the waterfront lifestyle of IWCity. The Cultural Centre Precinct is designated for recreation, featuring a “Luna Park” family IWCITY HARBOURFRONT entertainment zone, secure swimming lagoon, tropical beach environment, themed entertainment and restaurant village as well as passive open space parkland. The Central Marina Precinct will bring forth the boating lifestyle of IWCity. With a rectangular recreational marina that can house up to 250 boats, an iconic Yacht Club and a public boardwalk promenade, the Central Marina is poised to become a unique nautical destination. The Marine Condo Precinct is an exclusive enclave of high-end waterfront condominiums with direct access to private deep water marina facilities and breathtaking views of the Johor Straits. 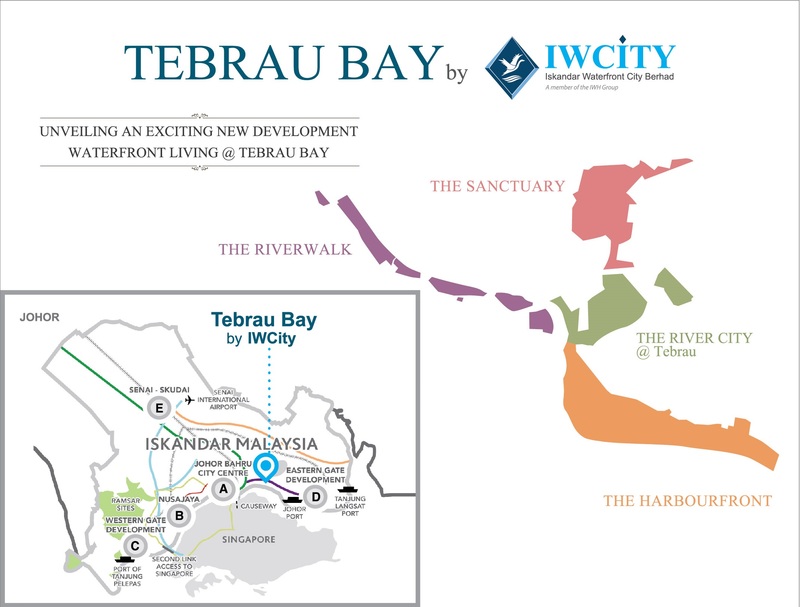 When completed, The River City will be the go-to destination in Tebrau Bay. 131-acres of integrated mixed development fronting Sungai Plentong, The River City @ Tebrau is poised to transform the landscape and direction of Permas Jaya. The River City @ Tebrau offers a waterfront lifestyle along the shores of a meandering river with a small boat harbour as the focus of the community. Meticulously planned, The River City @ Tebrau will offer a riverfront lifestyle that is vibrant and luxurious. Tebrau Gateway features a statement-making cluster of riverfront condo towers overlooking exclusive ‘over water’ townhouses on the river. IWCity Riverwalk is a tourist-oriented destination with themed shops and F&B outlets lining an internal canal, a unique feature of IWCity Riverwalk which creates an interesting pedestrian waterfront experience for visitors. Anchored by a hotel and a visitor boat marina on one end, and a transit centre and riverfront park at the other, IWCity Riverwalk will be a thriving pulse of IWCity. Located at the upper reaches of the Plentong River. IWCity Sanctuary is set to become an urban neighbourhood with the meandering river as its focus. A linear park and waterway greet visitors, creating a continuous, publicly accessible open space amenity. This will be a sanctuary for the community with an integrated mixed-use centre, small boat and water taxi landing, school and community facilities, and a landscaped pedestrian bridge accessing the riverside promenade.